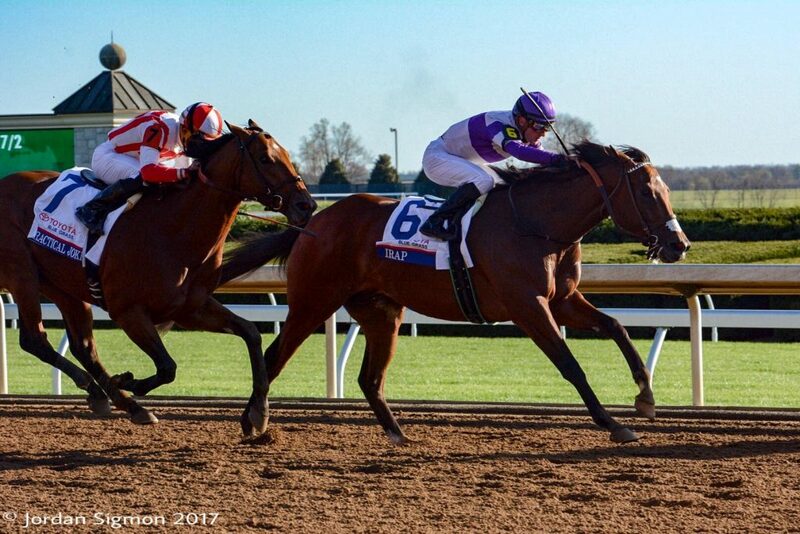 Irap broke his maiden in the Blue Grass Stakes (photo by Jordan Sigmon). Reddam Racing’s maiden Irap faced a strong field of six other sophomores, more than half of which were graded stakes winners, and earned his first trip to the winner’s circle as well as a ticket to the Kentucky Derby with his 3/4-length victory in the $1 million Toyota Blue Grass Stakes (GII) at Keeneland on Saturday. The Doug O’Neill-trained son of Tiznow was ridden by jockey Julien Leparoux for the first time and earned 100 coveted Kentucky Derby points to make the starting gate in Louisville in four weeks. In a race filled with highly regarded runners and Eclipse Award finalists, and despite being multiple graded stakes-placed, Irap left the gate as the second-longest shot on the board at odds of more than 31-1 and was good for $64.60, $22.40 and $6.80. Practical Joke, at odds of 7-2, paid $5.60 and $3.20, while the previously undefeated 8-5 favorite McCraken crossed the wire three lengths behind the runner-up and was good for $2.40. The exacta returned $328.60 and trifecta $1,022.60. J Boys Echo, Tapwrit, It’s Your Nickel and Wild Shot rounded out the order of finish. After a clean break from all, Wild Shot sped right to the lead and, with Irap stalking and to his outside, set the pace for the first half-mile in splits of :23.79 and :48.74. As the early frontrunner led the field around the bend, Irap was in full flight and reached command before three-quarters went in 1:12.36. Irad held a 1 ½-length advantage as he passed the eighth pole in 1:37.35 on his left lead and, soon after, received a challenge from the fast-closing Practical Joke inside the eighth pole. Under a vigorous ride from Leparoux, Irap remained on his left lead down the lane and dug in to hold off the runner-up, stopping the Teletimer in 1:50.39 on a main Keeneland track labeled “fast”. “It’s great [for a horse to break its maiden] in the Blue Grass,” Leparoux said. “The plan was to be sitting second. He was very relaxed. We had the trip that we wanted. [O’Neill] wanted me to start going at the half-mile pole. He said if a horse came up to him, he might back a little. Irap, who is a son of Canadian champion Silken Cat (by Storm Cat) and, therefore, a half-brother to champion sprinter and Breeders’ Cup winner Speightstown (by Gone West) was bred in Kentucky by Aaron and Marie Jones and was purchased for $300,000 as an Ocala Breeders’ Sales 2-year-old in training just more than a year ago. With the $600,000 winner’s share of the Blue Grass purse, he has now banked $772,600 and his record stands at 8-1-3-1. He finished second in last year’s Los Alamitos Futurity (GI) and the Robert B. Lewis Stakes (GII) in February.